As a musician, there is a pivotal moment in every career that marks the transition between the amateur musician and the professional musician. This moment usually boils down to the process of recording your music. One of the most time-consuming aspects of a musician’s life, recording ranges from the simple recording to writing your music in the studio environment. Fortunately for you, there are a wide variety of microphones you can choose from for different purposes. In this article, we will be explaining what to look for and how to choose the correct drum microphones for your records. I am currently studying audio technology and computer science at American University, the best school in the United States for audio production. I have played the drums for over ten years and recorded bands and drummers for half of that time. As I continued my studies of audio production, I began to dive deeper into the topic of audio signal processing, where I have worked on tools that allow you to record sound to your computer. I created synthesizer application that can work with any MIDI keyboard to reproduce sounds based on the specifications of the synthesizer. In my time, I have had an extensive relationship with almost every brand on the market and the top microphones from each brand. The SM57 is cheap, durable, and maintains a great profile for recording drums with a frequency response between 40Hz-15000Hz. Microphones are an electrical device that transforms one form of energy into another. A microphone utilizes a transducer to convert sound pressure levels into electrical energy. This process is the impetus to all forms of modern recording technology. As you may know, a microphone can be used for an assortment of tasks. These include different fields within recording and communication. Without microphones, our world would not function because almost every aspect of our lives use microphones in one way or another. When discussing microphones, it is important to distinguish between the three general types. Each of these microphones is used for specific purposes and as we will see, each one is better for recording different aspects of the drum performance. The dynamic microphone is the most durable microphone. However, this is not where the term “dynamic” comes from when discussing a dynamic microphone. The dynamic characteristic of this type of microphone is generally in relation to what the microphone is capable of recording. The method in which dynamic microphones recording sound pressure levels is based on the electrical conductor that moves into a magnetic field when coming in contact with any sort of sound pressure. Therefore, the electrical signal created by a dynamic microphone is by means of electromagnetism. In essence, the dynamic microphone acts as the opposite of what a loudspeaker does. Instead of recreating sound through a moving coil, the dynamic microphone will capture sound. A great comparison to the dynamic microphone would be the condenser microphone. The condenser microphone utilizes the same principles as the dynamic microphone with one caveat. In order to use a condenser microphone, you need an external power source known as “phantom power” or a +48V of power. This external power source creates a more sensitive microphone by utilizing electrical plates that will ultimately move the coil that captures the sound pressure levels. Thus, instead of a moving coil, a condenser microphone utilizes a moving plate. The final type of microphone is the ribbon microphone. This microphone usually resides within professional recording studios as opposed to the “average joe’s” collection. This is primarily due to the delicate nature of the microphone as well as the cost. The lower tier of ribbon microphones lies around the $500-$800 range. This is mostly based on the impeccable build quality, intricate details, and overall process of manufacturing that are associated with creating a solid ribbon microphone. The ribbon microphone is the most sensitive out of all types of microphone and this is why it is named the “ribbon” microphone. Instead of utilizing a coil or plate, the ribbon microphone uses a thin aluminum ribbon to transduce any sound pressure waves. The largest problem that many aspiring recording musicians face is the vast amount of sonic qualities that must be reproduced when recording a drum kit. It is nearly impossible to suggest one microphone for an entire drum set. There are many occasions where I or my colleagues will use upwards of 12 microphones for a five-piece drum kit. So recording drums, explaining how to record drums, and setting up to record drums are a complicated procedure and task. But the most important thing to understand is what qualities you are interested in capturing as it pertains to each type of drum or cymbal. As stated above, the type of drum set you are recording will play a pivotal role in the microphones you decide to use for recording. The following paragraphs will explain the difference drums and the characteristics that most audio engineers attempt to capture in the studio. The snare drum is the heartbeat of any song. 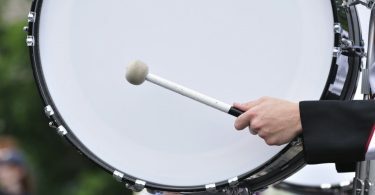 If you have ever heard a snare, the characteristics can be described as sharp, fast, loud, and primarily within the 500Hz- 4000kHz. Of course, this can vary based on the type of snare, but this will be the outline we assume. The characteristics of a snare are best captured by a dynamic microphone. This is primarily due to the characteristics described above, however, there is another important factor to consider: the placement of the microphone. The snare microphones (there is usually one above and one below the drum) is in close proximity to the drum. Because of this, the microphone tends to get hit more often than one would like. As stated above, the dynamic microphone is great for handling fast sound pressure waves as well as hits. 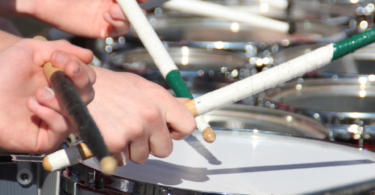 Like the snare drum, the kick drum can be equated to the heartbeat of any song. 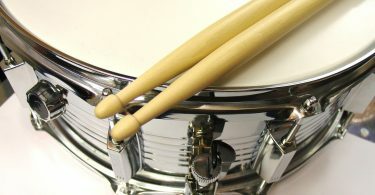 Maintaining similar characteristics to the snare drum, a kick drum requires a dynamic microphone as well. Alternatively, the kick drum can range from 50Hz – 1000Hz depending upon a variety of factors (size, length, position, room, etc). A kick drum usually requires a dynamic microphone that accentuates the lower range. When micing a drum set tom drums are not as clear cut. 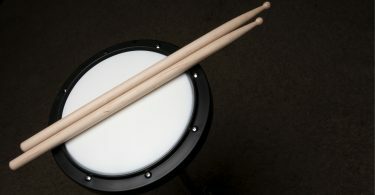 The problem regarding a tom drum lies within creating the sound you or your band is attempting to capture. You have two options when choosing a microphone for your tom drums. Utilize either a small-diaphragm condenser microphone or a dynamic microphone. The difference between the two is based on sound reproduction. When choosing a dynamic microphone, you are aiming to capture the “attack” qualities of the tom drum as opposed to the resonant qualities that will be captured in a small-diaphragm condenser microphone. Many musicians fail to include a vital aspect of the recording process when they choose to record the drums itself. Recording the sound of the room will provide a more realistic sound for your recording, giving a natural element to the recording that is not found in the majority of amateur records. 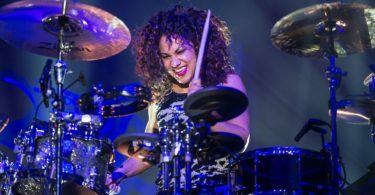 Capturing the room is not necessarily about the drums, in fact, it is about capturing the spatial characteristics that make drums sound so big, natural, and powerful. This is a great scenario to incorporate a large-diaphragm microphone or a ribbon microphone. A ribbon is ideal as it will capture the intricate details (the sound of the walls, ceiling, reverberance) where the large-diaphragm will capture a lesser quality of this sound. Now you understand which microphone to choose for the respective drum, but how do you discern the quality of the microphone? There are many different aspects of a microphone to consider if you want the best recording. Many of these terms are universal in the microphone market. When you search for a microphone the specifications will usually include terms like frequency response, polar patterns, SPL handling, and pads. 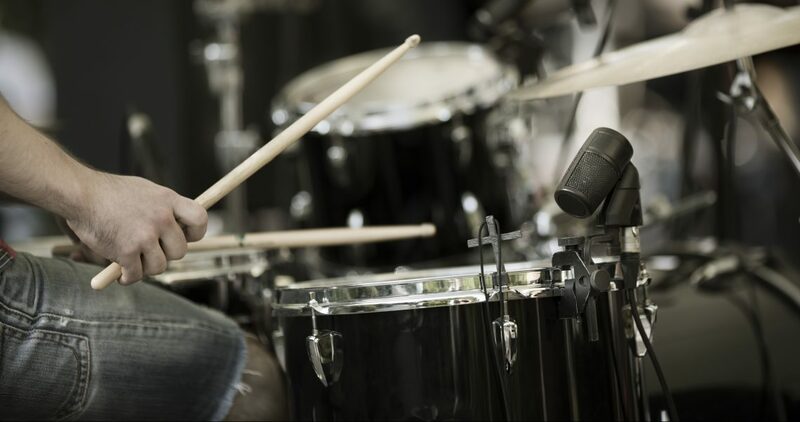 It can be argued that recording a drum kit is the hardest instrument to record because of the variety of characteristics you must handle throughout the process. Fortunately, these specifications will give you the answer to what you will be using each specific microphone for. The frequency response is vital to any audio equipment. In a short explanation, it explains how the audio equipment will act on specific frequencies regarding amplification and attenuation. For example, Beats by Dre headphones maintain a frequency response that does not replicate the true sound. Referring to the graph, the headphones amplify bass frequencies and attenuate higher frequency frequencies. When you are looking through the specifications of different microphones, it can be beneficial to see how the frequency response compares to the general range of the instrument you are recording. As an example, a microphone that amplifies the 500Hz-3000Hz range may be great for recording the snare drum (depending on whether you are looking for that sound). This concept can be hard to understand without a physical microphone in front of you. However, many microphones have various options allowing for a range of polar patterns while others have a single polar pattern. A specific polar pattern will tell you where a microphone is acquiring sound pressure levels from. The different polar patterns (non-comprehensive) can include cardioid, bi-directional, omnidirectional, and hypercardioid. Each polar pattern will serve a specific purpose. Cardioid – picks up sound pressure levels in the direction that a microphone is facing. Bi-directional – picks up sound pressure levels where the microphone is pointed and on the opposite side. Hypercardioid – same characteristics as cardioid, but more sensitive. Sound pressure level explains the level at which a certain microphone can handle sound. For example, a ribbon microphone will have a lower SPL handling level than a dynamic microphone because it is more sensitive to sound. 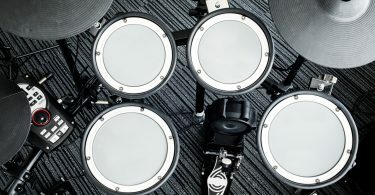 There are primarily two types of padding, frequency pads, and gain pads. Both of these are important. However, gain pads are more useful when recording drums. A frequency pad can be called a cutoff in some cases. This denotes a switch or a characteristic of a microphone that explains a certain frequency where a microphone will “roll off” any captured frequencies in that range. For example, some microphones are built with a 200Hz cutoff. When activated, the microphone will note transduce any frequency below 200Hz. Alternatively, a gain pad will simply reduce the amplification of the recorded audio. As mentioned previously, the best microphone on the market for recording a drum set is the Shure SM57. You may notice how cheap it is in comparison to many other microphones — this is one reason why it ranks higher than most microphones. The SM57 has been a go-to microphone for drums and live sound for the duration of its lifetime. The SM57 is cheap, durable, and maintains a great profile for recording drums. This is easily understood when viewing the specifications of the microphone. The frequency response lies between 40Hz-15000Hz. It weighs 9.9 ounces, it is a cardioid microphone, and can withstand drops, throws, and hits like no other microphone. In fact, when compared to microphones that cost over ten times the SM57, the Shure microphone consistently captures the best sound when recording a snare drum. The SM57 has been an industry standard since it was released to the public in 1965. The primary reason for this stems from its ability to isolate noise (cardioid design), consistently work (dynamic microphone), and reproduce rock instrumental sounds (frequency response). This is primarily why it has been used on the majority of rock “hits” since its release. The price of an SM57 has remained around $100 USD for the past decade. However, there are moments where it will move to $90 or $110 based on the time of year, etc. This is another factor that makes the SM57 great. Without spending upwards of $800 on a full drum microphone kit, you can buy one microphone and create an intermediate or demo sound with only $100. If you wish to create a professional recording, the SM57 cannot be your only method of recording. This will create a flat recording that will most likely lose any sign of the human element. This is primarily due to the dynamic capabilities and the frequency response provided by the microphone. Although the microphone is the greatest value, it is not to be considered an “all-in-one” microphone. With this frequency response, the SM57 will be unable to properly reproduce the sound of the drum cymbals because their frequencies tend to lie within the higher range of the frequency spectrum. The SM57 can only be used with a cardioid polar pattern. It will be difficult to position it in a manner that will fully capture the essence of your performance. To contrast, there are many microphones that can be placed in the center of a kit and capture a relatively good sound of the drum kit. 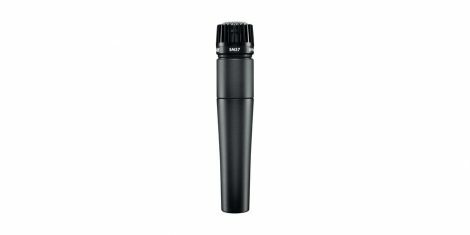 An SM57 will be a perfect microphone to buy if you had to choose only one microphone for your drum kit. If I were tasked with recording a drum set with just an SM57, I would position the microphone about six feet away from the drum set, pointing about two feet above the kick drum. This way, you could capture the entirety of the drumset, and acquire some room noise in the process. There is no best microphone because there is a wide range of factors you must keep in mind when choosing a microphone. But this microphone is our favorite because it provides a fantastic value while remaining cheaper than 90% of microphones. It’s incredibly versatile, perfect for live performance vocals as well as micing every drum. The next best microphone is considered one of the best recording microphones in production. 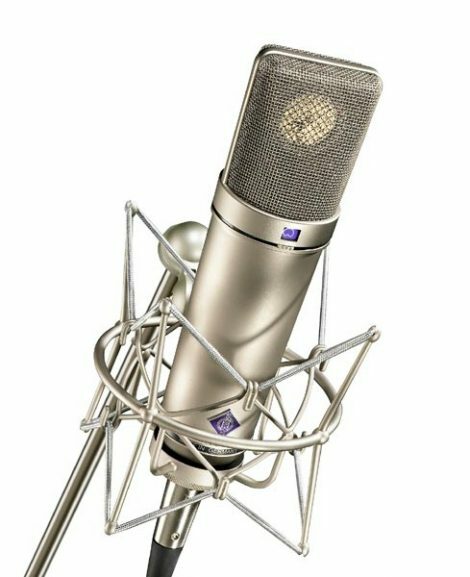 The Neumann U87 will be available in any reputable recording studio because it is one of, if not, the best condenser microphone ever made. In my own recording sessions, there have been only two times that I have not utilizes a U87 on the drum set. This was due to an esoteric circumstance where the artists were looking for higher levels of distortion. This is probably my favorite microphone because of the way it picks up room noise, string instruments, and cymbals. Utilizing this microphone as your only microphone will produce great results at a high cost $2800-$4000. However, this is worth it, especially as you begin to compare microphone quality. The U87 can be utilized in two different ways when recording a drum set. Because it is a condenser microphone, I highly recommend not using this as a cardioid microphone near a particular drum. Alternatively, using this as an overhead or room microphone will garner the greatest results. Being frugal with the mission to record drums is nearly impossible. This is why many artists choose to utilize programs that emulate a drummer instead of recording themselves. However, when you opt for this, you lose the vital “human” element of the recording. Purchasing a pair of the Neumann KM184 will give you the ability to record any drum set you wish. These microphones are commonly used for overhead microphones (placed about six to nine feet above the middle of the drum set pointed diagonally towards the drum set). This purchase will allow you to capture the majority of your drum audio. Similar to the SM57, the Beyerdynamic M201 is a unidirectional dynamic microphone. It is applied in a similar fashion (pointed straight towards a drum) but produces a far superior result with a frequency response of 40Hz-18000kHz. The Beyerdynamic is primarily utilized in the studio to capture the drums or hi-hats along with any other instruments that produce “sharp” audio.